Holi was celebrated with great fanfare and enthusiasm in Belgaum with people from all communities participating in the festivities. Men, women and children came out in groups, splashed colours and greeted each other and danced to the drumbeats. In Pangul galli, a large number of revelers and devotees performed “Lotangan puja” (“urulu seve”) at Ashwathama temple. The festivities started on Tuesday night with the lighting of bonfires to signify the burning of demoness Holika, sister of Hiranyakashyapu. 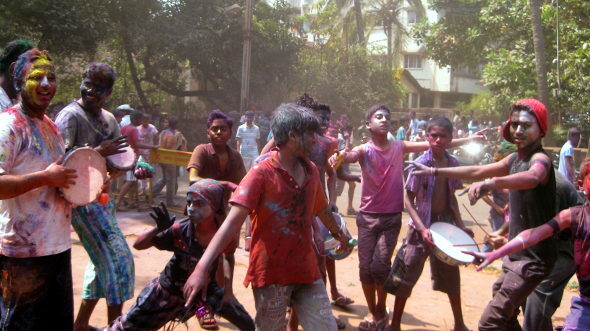 Ohhhh misss the Belgaum Holi som much..